The Accutower SD/Micro SD Duplicator allows you to copy up to 15 SD or Micro SD cards at once! This duplicator loads, unloads, and copies independently. All file formats, file sizes, and card capacities are supported. You know that old saying, “Sometimes less is more”? There are times where “more is more” is what’s really needed, and that’s especially the case when it comes to duplicating SD cards. Duplicating a couple SD cards at a time could seriously slow down your day. Why sacrifice all that time when you can get a state of the art machine that can handle up to 15 SD or Micro SD cards at once? The Accutower SD/Micro SD Duplicator is built to be a card-duplicating powerhouse. Forget less is more: With this Accutower model you’ll be producing more and more cards in no time! 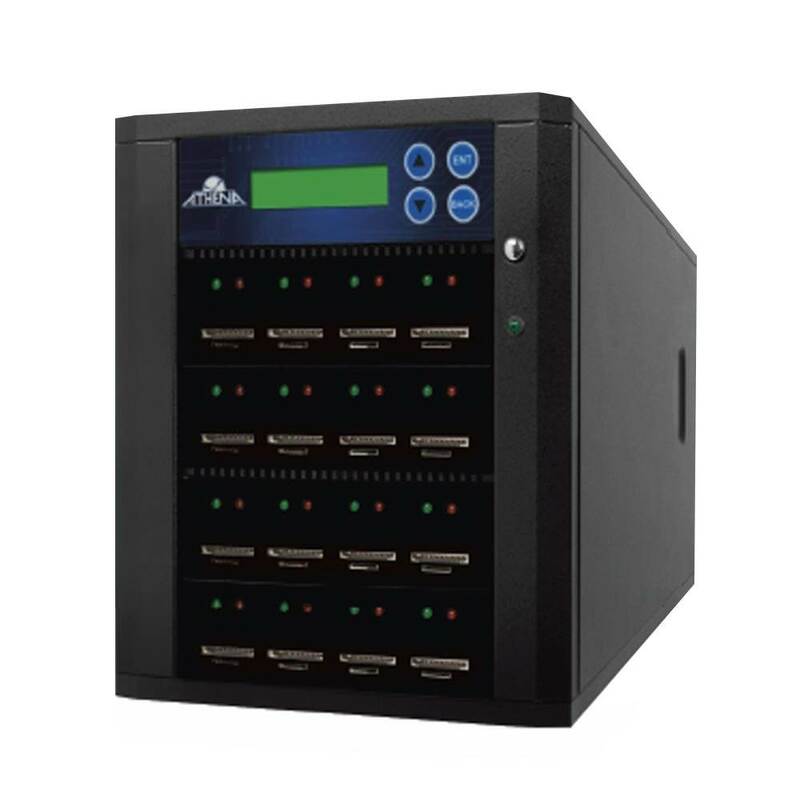 The Accutower SD/Micro SD Duplicator lets you copy up to 15 SD or Micro SD cards at once. It’s a hands-off machine: The duplicator loads, unloads, and copies all the cards independently. It supports all file formats, file sizes, and card capacities. Best of all: The Accutower is a stand-alone operation! No PC required- All you need to get going is the Accutower SD/Micro SD Duplicator. Why use antiquated duplicators that can only do a few cards at a time when you can have a modern dynamo that can give you 15 all at once? Why wait days, even weeks, for another company to duplicate your cards when you can quickly fulfill your own order on your own? Stop killing time: Save it with the Accutower SD/Micro SD Duplicator! Support Synchronous and Asynchronous copy modes. With improved SOTA technology, SD/ Micro SD duplicator can do Asynchronous copy even if the source data size is bigger than duplicator system memory. ** Actual write speed may vary depending on SD card write speed. *** Specifications are subject to change without notice.